H ello, friends. So, how is everyone? Wait, what did you say? You are happy because it’s almost fall? I didn’t even notice. Bwahahahah. OK, I noticed. And I have seen your emails asking about when Fall Nesting is starting, YAY! Thank you. I’m glad you are looking forward to it as much as I am! If you aren’t a big Fall fan, thanks for putting up with me! If you are new here, every day since the dark ages of blogging, I’ve done a Fall nesting series. It’s what I do. Some years I’ve done 31 day series and decided no one needs to hear from me 31 days in a row. I mean, honestly. I don’t need to hear from me that often. But on the other hand, if you think about it, 31 days is just not enough. You know what I’m talking about. Fall. Enough said. So, here’s what I’m gonna do. I’m going to be talking about Fall nesting as often as I want to. Because, it’s my blog and I can’t help it, Fall nesting only comes around once a year so I don’t want to limit it to 31 days. Every day is Fall Nesting in the Fall. I might as well call it 90 days of Fall Nesting. You may have notice that I already started on Fall posts, I couldn’t even wait so technically I’d say I’ve already done like seven days of Fall Nesting counting today so you just have to hang out here because Fall’s gonna happen. I linked up six of the Fall posts I’ve already done this season, below. 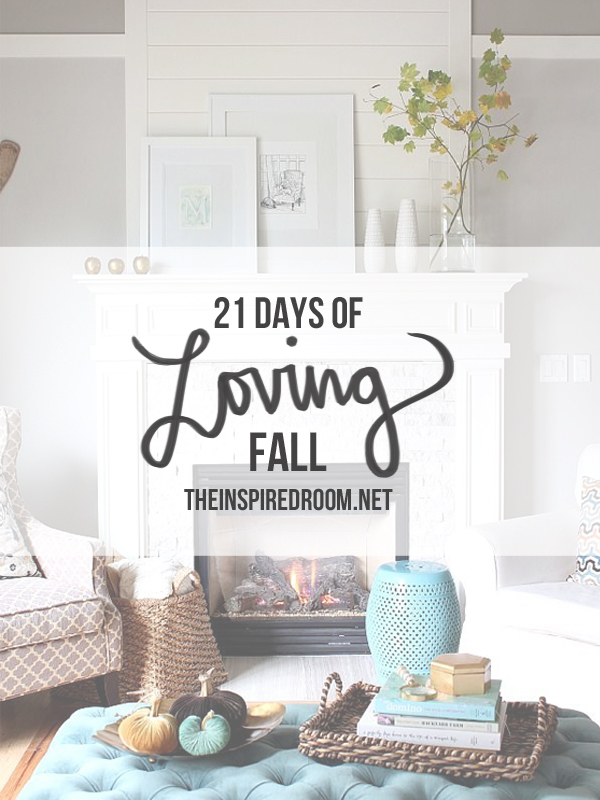 This time for Fall Nesting I have a fun little series I’ll be starting soon called 21 days of Loving Fall! The posts won’t be 21 days in a row but I will share 21 posts over the fall season featuring fall things I love, fallish things I’m thinking about, or fun things my family is enjoying in the fall. It’s a win-win. If I do more than 21 days, so be it. But 21 days just feels much more manageable to me than 31 in a row, so we’ll see how this goes. I’ve always got lots of Fall and cozy and nesting and comfy stuff to talk about, so just come everyday anyway :) Fall is my favorite. I’m super excited this year because I’ve been asked to participate in two online Fall home tours, so you will be invited over to see how I’m nesting up the house!!!! The first tour is here on September 15th and the next one (I will share different things each tour!) will be here on September 23rd! I’ll give you details so you can follow along with the other bloggers, too. I also have some very good news coming up about a long-awaited magazine feature :). Ahhhhh! Let’s get our Fall nesting on! You can also check out my Fall gallery here, and last year’s 31 Day Fall series here! Looking forward to you Fall series! I absolutely love Fall. So I am so excited for this series! Happy Fall Melissa! if I know you even a teeny bit, you’ve been Fall nesting since Aug 20. and I love it. I couldn’t wait till Sept 1! the crunch of leaves underfoot. cool days followed by cozy nights. college football. jeans tucked into knee high boots. warm vests over turtleneck sweaters. pumpkins scattered everywhere. did I say college football? Will there be any linky parties for Fall Nesting so the readers can share thier decorations and nests too? I really enjoy seeing the other readers as much as the “pros”! I’m ready!! (I just posted my first Fall post too!) Can’t wait to see what you have up your [cozy sweater] sleeve this year! I just love how so many people are excited about fall. It’s a wonderful time of year. Fall is my favorite season! It’s getting cool. School is starting ( I’m a teacher and LOVE teaching). The leaves are beautiful. I love Fall coking; apple cider and pumpkin pie,yum. I’m in a new (old 1959) house and finally have a real wood burning fireplace. Can’t wait to light it and cozy up my house! We also have some beautiful mature, HUGE trees. Wonder What colors the leaves will be? Hi Melissa, You know I’ve followed your Fall nesting series for several years now. Time flies. You inspired me to write a 25-Days of Christmas series last year and 25 days in a row of holiday posts was a lot of work-lol. I’ll definitely keep an eye out for your upcoming Fall posts and I look forward to the creative inspiration. Okay, y’all, it is 98 in Dallas, Texas. I love fall, I am in a fall frame of mind already and I think we have a cool front later this week that might be just a little fallish! You can never have too much fall, bring it on, I will read every post! Oh I love Fall Nesting, so can’t wait to follow more. Since I have a September birthday I’ve always had a special preference for fall. Oh boy, plush pumpkins and fall treats!